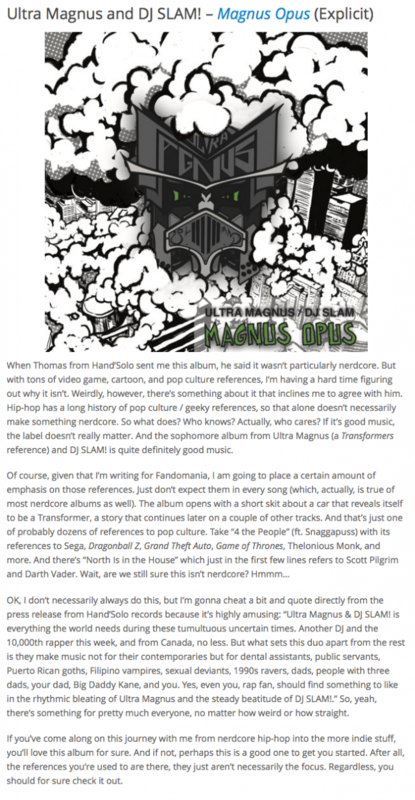 Hand'Solo Records » Blog Archive » Fandomania reviews Magnus Opus and interviews Ultra Magnus & DJ SLAM! Home Bass > Fandomania reviews Magnus Opus and interviews Ultra Magnus & DJ SLAM! Chad Walker reviews Ultra Magnus & DJ SLAM!’s sophomore album, Magnus Opus, for Fandomania and he also talks with them recently about their new album, current fixations, and nerdcore for his Geek Music podcast.